I love cajun food. That’s why I wish there were more Cajun restaurants around Vancouver. So when we were given the task to create and design a menu in my Design Esthetics class, guess what immediately came to mind? 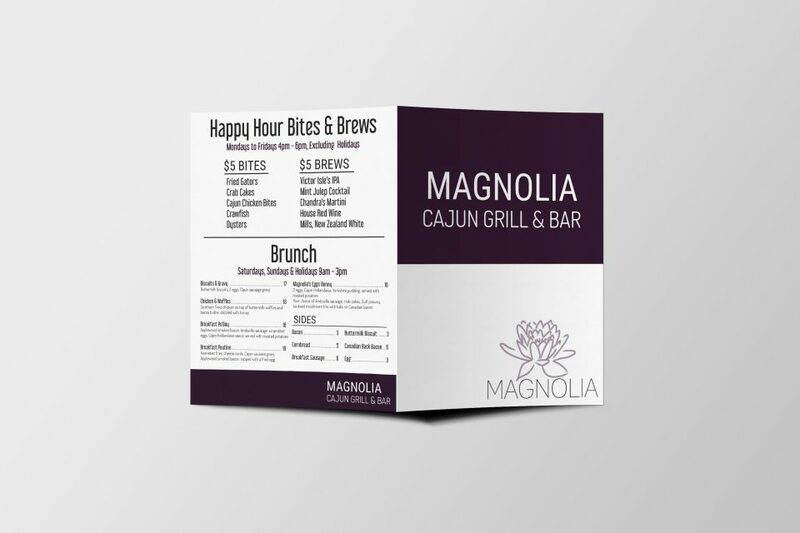 I find the name Magnolia is suiting for a Cajun restaurant because it’s also the state flower of Louisiana. 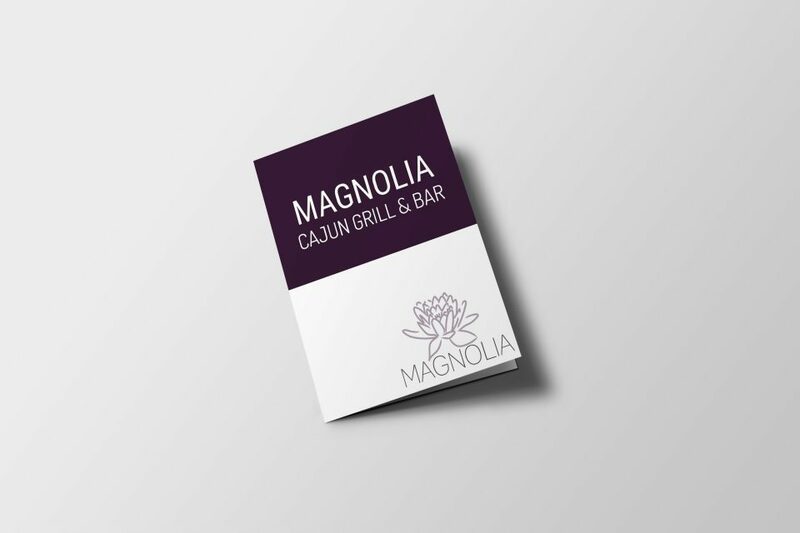 While I was writing my design brief, I wanted to brand Magnolia as a modern cajun-styled restaurant, with a bar & grill image and serves authentic cuisine. I wanted the place to appeal to the 20 to 30-something crowd by featuring a Brunch, Happy Hour, and Drinks section. Why the Grill & Bar vs. Bar & Grill? That’s one question the guy at the print shop asked when I went to pick up my printed assignment. My decision was mainly because Bar & Grill sounded very rustic. Picking a colour swatch is always a fun but also indecisive process for me. I wanted the modern look, and decided to keep the pages of my menu white. When I think Cajun, bright colours such as red, yellow, and green come to mind. But that wasn’t going to give the menu the modern and sophisticated look that I wanted. I decided to opt for darker colours, and chose a deep purple as the main colour. I played around with Adobe Kuler some more and decided on a lighter hue of the purple, and a charcoal colour to complete the swatch. I used Roboto Condensed for the most important labels throughout the menu. That included the Magnolia title and every section heading of the menu. Libel Suit was used on every single menu item. 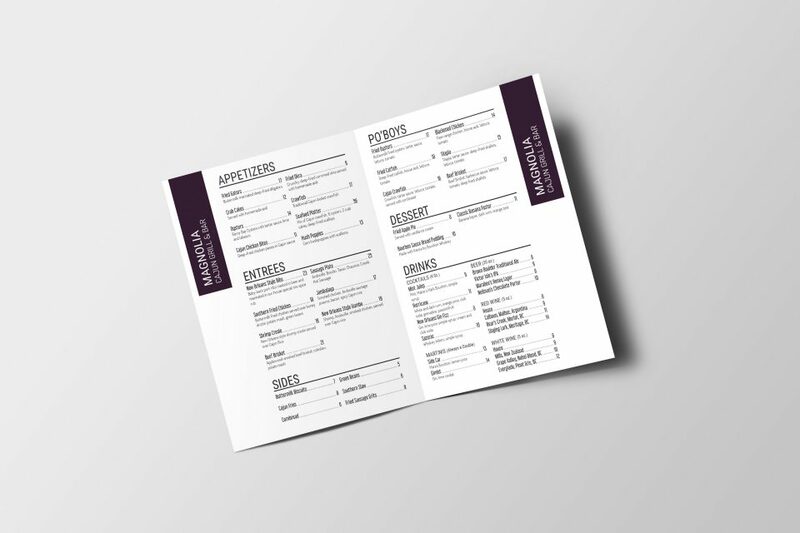 At first, I had used Dosis for the menu items but didn’t quit like how it looked as a larger font. Libel Suit turned out to be perfect because it’s has a more funky-feel. I still quite liked Dosis as a lighter font, and opted to use that for the menu description. Since the name of the restaurant is Magnolia, the logo should be a vector image of that flower to further accentuate that name. I played around with some drawings and decided on a flower sketch with the “Magnolia” text underneath it for my logo. The colour I chose for the flower shares similar hues to magnolias, as well as the main colour of the menu.